I was born and raised in The Netherlands. In my earliest memories I recall loving to read, and being read to by my parents. My father would read fairy tales to me, and I devoured books with animal characters. The tales of Pippi Longstocking were favorites, as were Alice in Wonderland and books by Jack London. (At that time I read these in Dutch translations.) I decided to major in English at the University of Utrecht in The Netherlands, and taught English as a foreign language for a few years in schools in Utrecht. When marriage brought me to Philadelphia, I became a travel consultant to Penn students and faculty. With the emergence of computers that job became less relevant, and I looked around for another career. My love of books and reading led to my job at the Lansdowne Public Library. This is where Susan Stone, then Head of School at the Lansdowne Friends School, met me one night and asked me to apply for the job as school librarian at LFS. My lucky day! Now I could reread my favorite stories in English and discover new ones with students at LFS. Running the school library is a labor of love and an ongoing project. The most difficult lesson a librarian has to learn is how to discard books in a thoughtful way. The rule of thumb is if a book has not been checked out for 10 years, it must make room for new ones. But, but!! Our library serves both teachers and students, so most books will stay if connected to our classroom themes, our Quaker values, and the varied backgrounds of our students and families. Fortunately I can usually find a new home for books that do need to be discarded. Just as my parents and teachers nurtured my love of books, I enjoy reading good stories to our students. I always discover new meanings, even after having read a book aloud for years. Having recently discovered the "Whole Book" approach to reading with kids, I encourage parents to bring their child into the story by asking questions about what they notice in the size, shape and illustrations inside the book, and on the book cover as well. The author Mo Willems leads children into the story by introducing his characters on the inside cover of his books, making the children want to read about them. So parents, do yourselves a favor and snuggle up with a young child and a book. 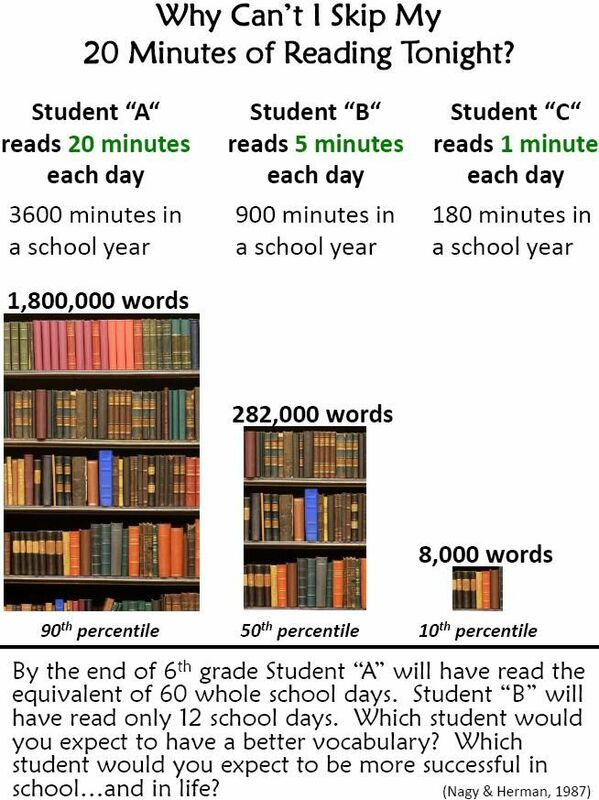 This chart will show the educational value of time spent this way!